Helmets are a crucial piece of safety equipment, but unless they fit just right, they can get uncomfortable. 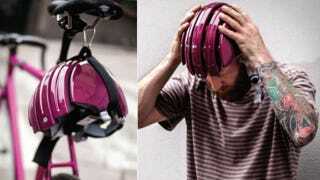 This new helmet by Carrera aims to solve that problem by stretching laterally to fit your fat (or not-so-fat) head. The design is inspired by old, leather helmets that had a bit more give to them. With its flexible frame, the helmet manages not only to stretch to fit your specific dome, but also can be compressed down for storage or travel. It also functions as an actual helmet, of course, and claims to be just as effective as any non-stretching helmet out there.